The third screening in our Classics on TV: Great American Playwrights season at BFI Southbank this month is of the 1976 Granada for ITV production of Cat on a Hot Tin Roof, Tennessee Williams’ 1955 Pulitzer-winning play of a Deep South family in crisis. Robert Moore directs this sumptuous production, starring Laurence Olivier, Robert Wagner and Natalie Wood. Book your ticket on the BFI website here for the 6.20pm screening on Tuesday 13 January 2015. Details about the rest of the series can be read here. There have been around ten productions of Tennessee Williams’ plays produced on British television. Happily, the only two of these productions that survive in the archives are both being shown, in different seasons, at BFI Southbank in the same week of January. The 1958 play Suddenly, Last Summer was given in BBC2’s Performance strand on 6 November 1993, and this Richard Eyre production, starring Maggie Smith, Natasha Richardson and Rob Lowe, is being shown in the Maggie Smith season just two days after Cat on a Hot Tin Roof: read more about this production and book your ticket here. 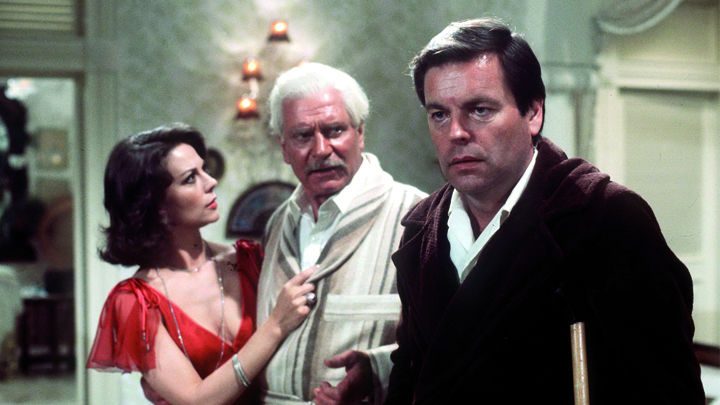 Robert Moore’s Granada for ITV production of Cat on a Hot Tin Roof, starring Laurence Olivier as Big Daddy (who is dying), Robert Wagner as his alcoholic son Brick and Natalie Wood as his dissatisfied wife Margaret (‘Maggie’), was transmitted on Sunday 12 December 1976, from 9.05 to 11.00pm. T his was the second in a series of six great plays of the twentieth century which were transmitted on ITV from 1976 to 1978. The selection of plays was by Olivier, who also acted in five of them, co-producing several and directing one. Olivier is reported as saying that ‘I have stood out stiffly and coldly and pompously about television for too long. I belong to an age to which television belongs and one has to get on with it’ (‘Lord Olivier Takes on TV Roles’, The Times, 21 May 1976, p. 4). This lavish production, designed by Peter Phillips, has visual resonances with big American series such as Dallas that would be transmitted in Britain in the following decade. The high ceilings, chandeliers and servants of Big Daddy’s mansion work to suggest inherited wealth, rather than the self-made fortune of a working man, and the necessary softening of the sparkier elements of the playtext also work towards this impression. As Philip C. Kolin, writing in the 2010 Methuen Drama edition of the play, considered, ‘Olivier looked more like a stately elder Mark Twain or slimmer Colonel Sanders projecting an aristocratic Big Daddy, not the self-made, coarse man Williams imagined’ (pp. lxii-lxiii). How thrilling it was to see around 150 people at the screening of Cat on a Hot Tin Roof in NFT1 last night. Thanks to all who came and made the evening feel like such a success — a feeling founded upon how beautifully the production played out on the big screen, how responsive the audience was at the many moments of humour in the production and how many positive comments about the production I received afterwards. One thing I would like to note is that the sound quality was notably better than I had experienced in previous prints seen on smaller screens. Cars were more audible pulling up to the house and driving away. The music accompanying certain of the more poetic speeches – such as when Maggie talks of what a good lover her husband Brick used to be – was effective in its mood-setting. The fireworks heard as Big Daddy traverses the upstairs landing sounded much more like gunshots, and this was powerfully evocative of the fact that he had just learned from his son Brick that he does, in fact, have cancer and this would be his last birthday. This production provides an interesting point of comparison with the 1958 film starring Elizabeth Taylor (Maggie), Paul Newman (Brick) and Burl Ives (Big Daddy). I’ve not seen a stage production at all, so I am not sure how much of the text was lost in reducing the TV piece to about 90 minutes. The TV adaptation strikes me as being somewhat more sedate than the film, even though there is shouting enough to bring a less solid house crashing down. It is perhaps something to do with the pacing, still slightly more geared for stage acting rather than the cinema, but lacking a live audience to generate the final spark. Perhaps another contributing factor is that both the lighting and the sound world were not (by modern standards) particularly subtle. All the indoor scenes were bathed in a uniform clear light with little reference to the presumed light sources of an interior. I doubt that anyone would have noticed this at the time, as it seems to have been common studio practice, but with modern (digital?) cameras we have become used to more light and shade. Similarly, though the background effects were indeed well managed, the microphones picked up uniform levels for speech (just occasionally some shadows from booms were visible as cameras pulled back from close ups). This made for some explosive moments when two (or more) people were shouting over each other – it really was extremely hard to disentangle what they were saying. At first I was frustrated by this, but as it was repeated I began to think it was entirely appropriate. Again, modern sound tracking might have had a different effect. My recollection of the film (some years since I have seen it) is that it was more circumspect about the allusions to the great friendship of Brick and Skipper. The TV production seemed more definite about this, but again, not knowing the play text, I am not sure if much was cut here. Also Maggie’s final invitation to Brick struck me as quite amazingly explicit – not so much for 1976, but certainly for 1955. The performances were very good. How anyone gets through a play constantly referring to ‘Big Daddy’, ‘Big Mama’ and ‘Sister Woman’ (let alone ‘Brick’ and ‘Gooper’) with a straight face is beyond me. But I was left wondering if Maggie was ever actually hurt by anything that had happened or was said to her – or was she just far more successful than her sister-in-law at managing her situation? Brick also seemed for the most part beyond anguish and utterly subsumed by world-weariness. These must have been deliberate interpretative decisions, but they left the piece as something of a spectacle of family dysfunction rather than an interior drama. Brick’s final question leaves us tantalisingly unsure whether or not understanding has led to rapprochement. Thanks so much, Nicholas – really interesting reflections. At the screening Amanda requested the audience to post their opinions on her blog. I assume this is the right place. I have a vague recollection of seeing this when it was first aired; but, apart from the 3 lead actors, don’t remember anything about it, so it was an enjoyable experience to watch it again. Like Nicholas, my thoughts are obviously influenced by the 1958 film, which I have seen several times, though not for a few years. I thought the whole cast were excellent, and it is worth mentioning the cast in the supporting roles who all gave very good performances. Jack Hedley, especially, I thought was excellent. However with this play, it is the 3 main roles which dominate and make or break the performance; and it is interesting to compare the interpretation of the characters. Paul Newman’s Brick, may have been full of self pity and loathing of everything close to him, but he was still full of passion and energy. 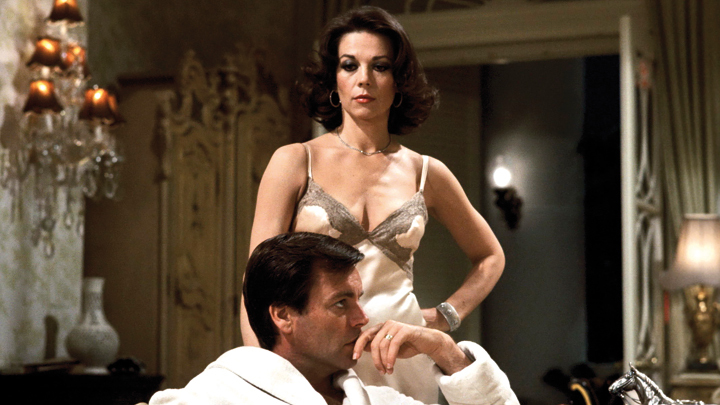 Robert Wagner’s character, I thought more effective, as he was devoid of the passion and energy. This was a man who had given up; and I think that is probably more believable. The only criticism I’d have of the role, is that through the play he was seen to drink an awful lot, and yet, his speech, and actions became no more impaired. Natalie Wood v Elizabeth Taylor? I think they were both excellent. Wood’s performance: her conniving, plotting, and manipulation was more subtle than Taylor’s; but they played the role in a similar way. I just prefer Wood’s portrayal on the whole. As for Big Daddy, I fear, Olivier, great actor though he is, is a pale comparison of Burl Ives’ masterpiece. Ives was larger than life, and completely believable as the self made man. As your programme notes indicate, Olivier came across more as someone born to wealth & power. His performance is good, and without Ives as comparison, would deserve the highest credit; but for me I always seemed to be watching Olivier acting, rather than Big Daddy. So, an excellent production, very enjoyable to watch, not especially spoilt by the passing of time; and good performances from the leads. Interestingly I read that Wagner felt he wasn’t really wanted by Olivier. Olivier wanted Wood, and Wood insisted on her husband playing brick. Maybe this “unwanted” feeling helped in his role. Thanks, Nicholas, for your welcome observations. Aspects of the text were certainly toned down for the television production, as well as the text cut overall somewhat. You’re absolutely spot on about the lighting too. It gave everything a rather glossy over-illuminated look, didn’t it? Thanks also, Chris – we really appreciate your time in contributing your thoughts. Really interesting observations, thank you, Chris! Interesting about Wood insisting on Wagner – I had not known that, and it does make for an interesting possible interpretation of Wagner’s performance! Thanks, again. Hopefully have your thoughts on later shows in the season. When I think of TW’s CAT now, the very first words that come after are Kim Stanley, the Big Momma of the Lange, Lee Jones, Rip Torn prod. (mid-80s? ); Her Emmy only confirmed what should’ve surprised no one: she virtually re-wrote the part: the blowsiness, the grief over B. Daddy’s nastiness, the general messiness of her emotionalism–a late-day vindication of the possibilities of Method acting when in the right hands. And the irony of RT’s eaten-away appearance as BIG (!) Daddy, putting the mendacity so much referred to front and center as a visual reinforcement every time he walks on stage–Brilliant! I never took the Wood-Wagner prod. seriously because of its Hollywood-ity but will now seek it out on line because of the above-shown regard for it. Thanks for your thoughts, John, and do let us know what you think of this production if you get a chance to see it!